2. Water Power: Here’s some hands-on fun! Feel the power of falling water to understand how it turned wheels and turbines in old Nova Scotian industries. Try to pump enough to move the wheels that power grindstones, a foundry bellows, a saw blade, or a carding machine. Interactive devices in this exhibit turn your energy into water power. It’s lots of fun and you can give it all you’ve got! Waterpower explores the past importance of harnessing the water of Nova Scotia’s many rivers and streams to power machines to produce flour, lumber, cloth, leather, iron and other goods. 4. Print Shop: Meet Sarah, a compositor at the local newspaper and daughter of the Master Printer, or her beau, Samuel, who is apprenticing to be a printmaker. Printers were skilled craftsmen, who learned their trade as apprentices or “printer’s devils” in early print shops. The Washington Press on display at the Museum of Industry is similar to many used to set up printing houses in small Nova Scotian towns. 5. Steam Power: Explore the power of steam in demonstrations of our made-in-Nova-Scotia stationary engines. A special treat is our machine shop, in which six machine tools dating from 1875 to 1910 are powered by a single engine. Hear the rumble of these large tools and the whir of pulleys and belts as museum staff explain the workings of the old machines and the hazards faced by those who used them. 6. “Samson” Locomotive: In the Age of Steam gallery, meet Samson, Canada’s oldest surviving steam locomotive. Built in 1838 by Timothy Hackworth at his Soho Works in Durham, England, Samson represents an early stage in the design of the steam locomotive. This example of the technology of the Industrial Revolution was commissioned for Nova Scotia’s coal industry, and worked for many years both on and near what is now the museum site. In 1893 it was displayed at the Chicago World’s Fair as an antique, and then came into the possession of the Baltimore & Ohio Railway until its return to Nova Scotia in 1928. 9. Iron and Steel: All the tools, engines and locomotives that characterized the industrial age began as molten iron flowing from a blast furnace. Nova Scotia was the birthplace of steelmaking in Canada. It offered the raw materials of iron, coal, and manpower ready to take on the challenge of making a metal of exceptional hardness and strength. Between 1850 and 1900, Nova Scotia had more than 100 foundries, large and small. See one of the giant molds that was used for casting steel ingots and some of the objects they made like stoves and engines and learn more about the casting process in the pattern shop. 11. Assembly Line Game: Assembly line technology revolutionized factory work and changed the way some goods were made. The skilled craftsman no longer created an entire item. Instead each worker had a few specific tasks to perform again and again at a speed governed by the pace of the line. Can you keep up? 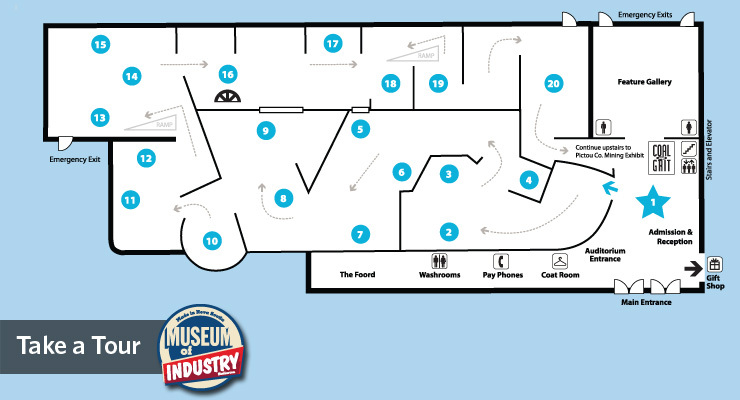 Our assembly line game allows visitors to build a model automobile while the conveyor belt keeps moving. Beat your friends or beat the clock but make sure the quality stays high! 12. Pressed Glass: Learn how pressed glass produced for the middle classes came to be collectable! From 1881 to 1892 the Nova Scotia Glass Company produced glass tableware here in Pictou County. They imported the raw materials and used local coal to fire the furnaces which could produce 13 pots of molten glass at a time. A workforce of skilled foreign and local workers created inexpensive glassware that allowed middle-class homes to enjoy extensive table settings previously only available to the wealthy. 15.Shopmobile: Not only did the wheels on this bus go round and round, so did its contents! An original Nova Scotian idea, the Shopmobile was a mobile industrial arts facility that traveled to rural areas of the province. Equipped with all the tools of an industrial arts classroom, including power tools, a portable forge and many hand tools, it was a unique forum to train school-age boys in wood and metal working. The driver was required to be a licensed teacher, responsible for the operation of the vehicle and the instruction of the classes. Step onboard Shopmobile # 3, one of five buses that operated in Nova Scotia between 1942 and 1964. 17. War Work: What an electrifying experience! This exhibit illustrates the many ways that Nova Scotians’ lives were affected by the introduction of electricity to homes, factories and offices. It gives us light and heat, made new kinds of work possible and put an end to others, helps us store and cook our food and clean up afterwards. Learn about the different ways that Nova Scotia life was affected in the early days of electric power in the late 1800s. Why did it take so much longer to get electricity to rural areas? See some of the early electrical appliances used by Nova Scotians. Who is Reddy Kilowatt and what is he doing with those lightning bolts?